Below you will see a video that I found and I liked on how to do abs at home, in the gym or wherever the mood inspires you. ybody who works out often, men and women, there are no specific requirements, you just have to know how to do the exercises correctly. Perform this workout every second day ie Monday, Wednesday, Friday, for at least two weeks. 1. 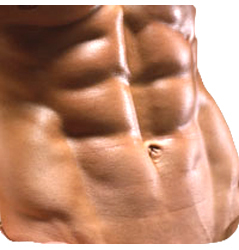 Working aerobically on your abdominal muscles for over 7 minutes stimulates the capillaries in this area. These in turn increase the blood flow. 2. A greater blood flow means a greater flow of oxygen - and fat only burns in the presence of oxygen. 3. Toned muscles need more calories (kcal) to stay active. Our organism tends to release these calories from the area near the active muscles. So it burns fat in that area. 1. The module is designed to work the abdominal area 'aerobically'. Performing it straight after an aerobic workout (e.g. : running, spinning, swimming or other aerobic activities) will improve the positive effect. 2. Learn the instructions for each exercise of this workout. Ensure you perform exercises properly. 3. Pay attention on the correct breathing while performing the exercises. It is very important and will help you achieve the best results possible.